It began with a colorful missionary procession and ended with a heartfelt prayer. More than 200 guests were moved, excited, and inspired at Lutheran Bible Translators’ kick off 50th Anniversary dinner in Lisle, Illinois. In the weeks that followed, hundreds more mission-minded individuals gathered at 50th Anniversary dinners around the country. Friends of LBT in Buena Park, California; St. Louis, Missouri; and St. Paul, Minnesota celebrated LBT’s successes in its first 50 years and learned about the organization’s vision for the next 50 years. The Rt. Rev. Dr. Paul Kofi Fynn, President/Bishop of the Evangelical Lutheran Church of Ghana, and Rev. Nathan Esala, who assisted with the Komba New Testament translation in Ghana, dynamically addressed the continuing need for Bible translation at the various events. 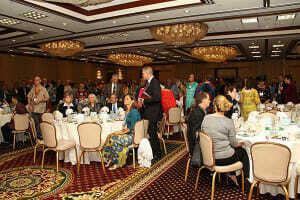 LBT has been privileged to host former missionaries, board members and staff at each dinner. 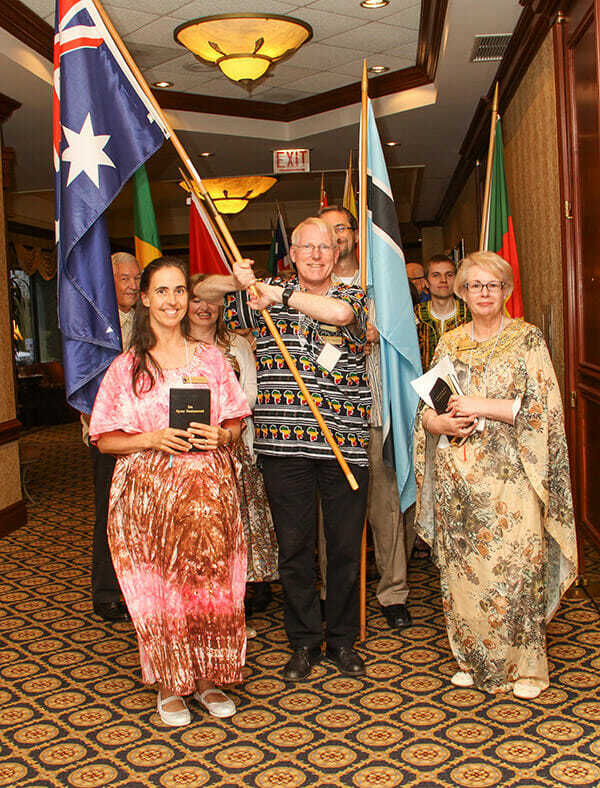 Long-time supporters of bible translation, such as Otto Hintze, one of the first LCMS missionaries to Papua New Guinea, joined the celebration in St. Louis. He and his family have been faithfully supporting LBT since 1967. Otto also served as the first secretary for LBT’s board of directors. He is but one of the many who have helped to bring God’s Word to millions of people through prayer and financial gifts. LBT was also honored by the presence of members of partner organizations and former co-workers. Rev. Dr. Douglas Rutt, Director of International Ministries for Lutheran Hour and former LBT board chairman, attended the St. Louis event along with Kurt Buchholz, current executive director of Lutheran Hour Ministries. Executive Director of the LCMS Office of International Mission, Rev. Randy Golter, also brought greetings and expressed gratitude for the work of Lutheran Bible Translators. In St. Paul, Rev. Tom Ries, president of Concordia University, welcomed guests and gave the invocation. During his comments at the various events, new LBT Executive Director Dr. Mike Rodewald posed the question, “If the Gospel is proclaimed but it is not heard, has the Gospel been proclaimed?” LBT missionaries struggle with that question, making sure that what is proclaimed can be heard. Rev. Amos Bolay, President and Bishop of the Evangelical Lutheran Church of Liberia, affirmed that people hear the Gospel and understand it best when it is in their own language. Rev. Bolay brought greetings from the church to those gathered in St. Louis, followed by a reading John 3:16 in his own Bandi language. The Bandi New Testament is one of 39 translations completed by LBT, available to the Bandi people since 2000. For more information about LBT, upcoming dinners, and how you can serve, please visit www.LBT.org or call 800-532-4253.